Since birds are predominantly diurnal and often quite vociferous animals, their behavior and ecological requirements are probably better studied than those of any other vertebrate group. Detailed knowledge of their evolutionary history is, however, still limited to a small circle of specialists, and there is a widespread belief that the avian fossil record is poor. 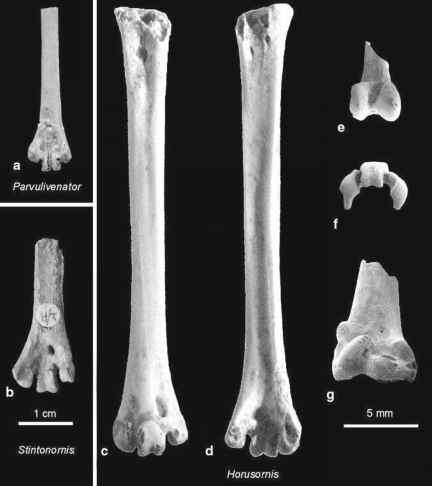 This is certainly true if the abundance of bird bones is compared with that of mammalian teeth, which are robust enough to survive even rough depositional environments and collection techniques. In many fossil localities complete skeletons and postcranial elements of birds are, however, not much rarer than those of other small land vertebrates. Numerous avian fossils in collections worldwide have remained further unstudied for decades, so the significant underrepresentation of birds in vertebrate paleontology seems to be due to a low number of specialists rather than a low number of fossils. Concerning certain geological periods and geographic areas, our knowledge of the early evolutionary history of birds is anything but poor. In fact, so many new fossils were described during the past two decades that it becomes increasingly difficult for a single person to cover the whole field of paleornithology. This book gives an account of the evolution of modern birds in the first half of the Cenozoic, aiming not only at specialists in the field of paleornithology, but also at ornithologists and paleontologists in need of detailed information, either for the calibration of molecular data or to set Paleogene faunas into a full context. Given the current pace of new discoveries, I am not cherishing the illusion that this survey will remain up to date for a long time. I do hope, however, that the overall framework outlined for the early diversity and evolution of modern birds will form a stable basis for future studies, and that the readers will find the book a useful source for their own research.